In conjunction with CX30: Creative Experiences, Thirty Collaborators – an exhibit curated, designed, written, and installed by helveticka to celebrate its thirtieth anniversary – the firm also produced a commemorative book. Entitled CX30, the 68-page limited-edition book commits to print all thirty of the exhibit’s featured stories: personal insights, anecdotes, and reflections from collaborators who played a role in helveticka’s success over the last three decades. Each of the stories is expressed using typography treatments that attempt to capture not only the essence of that story, but also the collaborator’s personality, making each page spread unique – just like the individuals themselves. 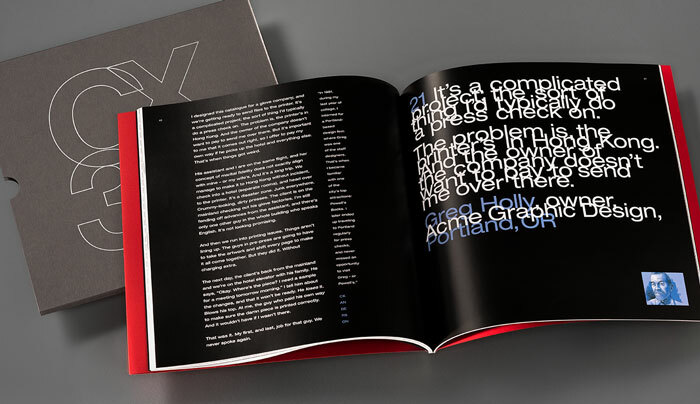 More than 50 different Helvetica fonts were used throughout the 11" x 11" book, which was presented to each collaborator at a ceremony August 4. The exhibit is open to the public until the end of the month.